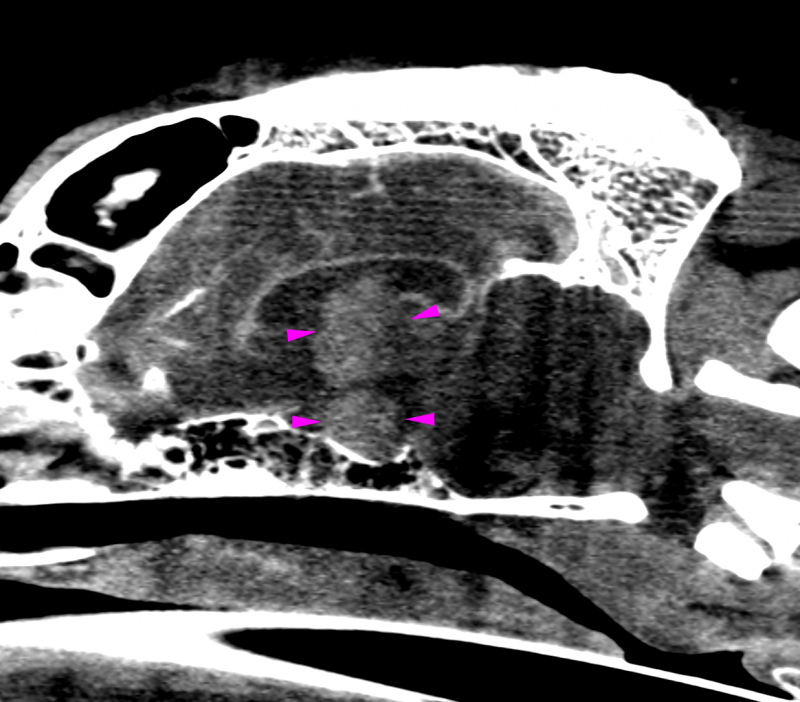 Sagittal post contrast image of the brain showing the choroid plexus tumor within the third ventricle with ventriculomegaly as well as the pituitary macroadenoma. Transverse post contrast image of the brain showing the choroid plexus tumor within the third ventricle and the pituitary macroadenoma. 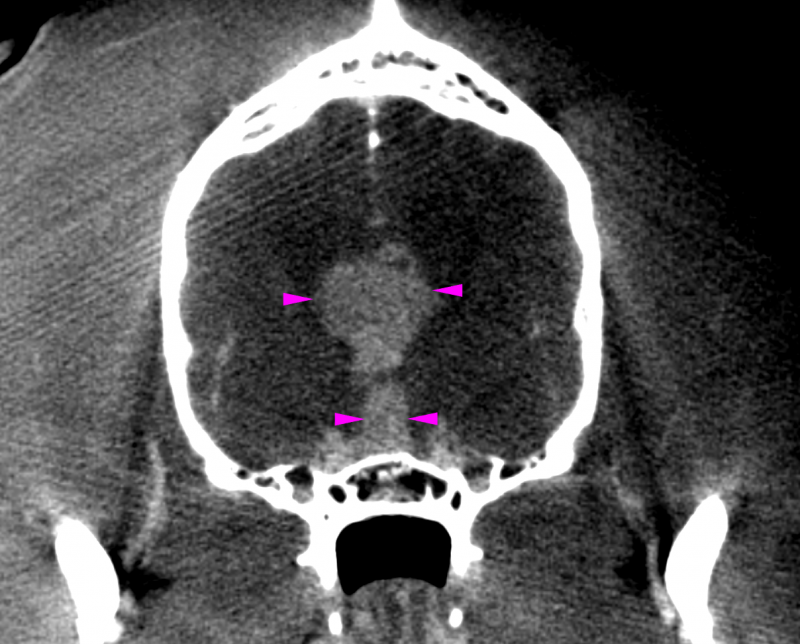 Both tumors reveal marked contrast enhancement which is typical for extraparenchymal lesions. Bilateral adrenal hyperplasia and modeling is seen. Hepatomegaly with parenchymal modeling is consistent with steroid induced hepatopathy in this case. Cushings & The Vimago CT. All day we receive ultrasound cases via telemedicine with the question of PDH vs ADH - is there a tumor or PDH? But what if we could put the patient through the Vimago CT "hoop" over about a 60-90 second time frame in-house? Know within 12 hours or less with the sonopath teleradiology interpretation as to PDH vs ADH, the characteristic of a pituitary tumor (macro vs micro adenoma) and if there is anything else going on such as this dual brain tumor patient? That’s the Vimago CT and telemedicine every day at SonoPath.com; your home for diagnostic efficiency (TM) that's not for specialty clinics any more. An increasing number of our telemed clients are general practices making their diagnostic efficiency rock through technology with the economically accessible, ground breaking Vimago CT. Many thanks to Dr. Tina Neel of Neel Veterinary for this interesting case and fantastic image set. Take a look at what Vimago found this week in this Cushingoid patient with the interpretation by Dr. Nele Ondreka DECVDI. Check out all of the CT applications in the 100+ more CT Vimago cases now in the SonoPath.com search engine for members with discussions in our easy access interactive forum. You know us as a community that is always pushing that envelope for diagnostic efficiency purpose here at SonoPath.com www.sonopath.com & Epica Medical International. An 8-year-old, F/S, 77 lb, Pitbull terrier was presented at RDVM for decreased activity level and behavioral changes. Blood work was performed and showed an increase in ALKP. The patient also had a dental cleaning recently where they extracted multiple teeth and put her on oral Tramadol. Owner says that she was “normal” on March 20th but has slowly been declining. Repeat blood work showed an increase in ALKP. Unable to perform physical exam due to hyper response. Owner reported the patient had become very head shy and aggressive with other dogs and had drastically changed in personality. 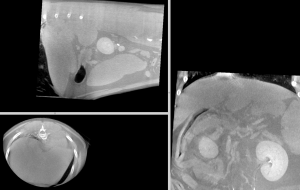 RDVM recommended a brain CT scan and it was decided to include the liver due to increased ALKP. Head: An extraaxial mass lesion of 1.5 cm diameter is seen within the third ventricle of the brain. The lesion is associated with the chroid plexus, irregular in shape and reveals marked non-uniform contrast enhancement. The lateral ventricles are dilated. The mesencephalic aqueduct and fourth ventricle are normal in size. A second strongly enhancing extraaxial mass lesion is seen in the midline dorsal to the sella turcica. The lesion measures 6 x 6 x 10 mm and exerts a mass effect on the surrounding brain parenchyma including the optic chiasm. 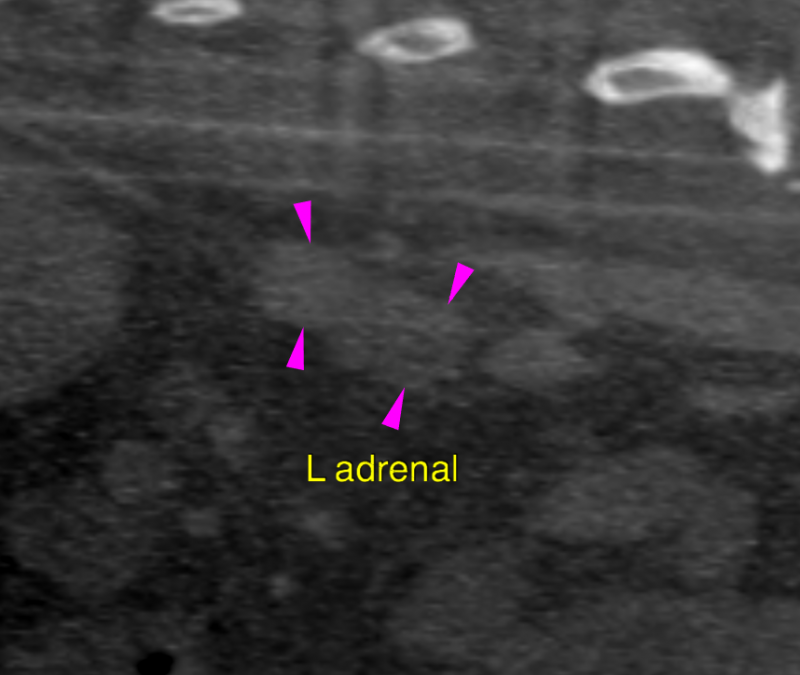 Abdomen: The liver reveals moderate generalized enlargement with lobar swelling and mild parenchymal heterogeneity. The vascular architecture of the liver is within normal limits. 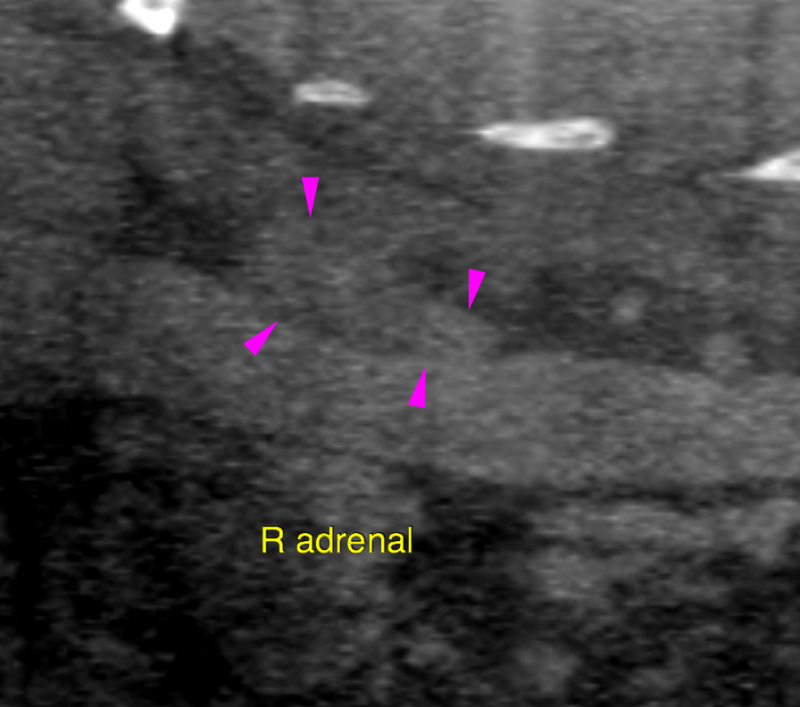 Both adrenal glands reveal mild symmetric enlargement. Overall assessment: The computed tomography reveals two extraparenchymal intracranial mass lesions – one within the third ventricle and one within the pituitary fossa. The most likely diagnoses are a choroid plexus tumor for the intraventricular and a pituitary macroadenoma for the second mass. Ependymoma, meningioma, cranipharyngioma and round cell neoplasia are possible but less likely differential diagnoses. A moderate secondary hydrocephalus internus occlusivus of the lateral ventricles is noted. Increased intracranial pressure is assumed. The findings of the liver are suggestive for diffuse parenchymal disease such as inflammatory, vacuolar or neoplastic infiltration. Together with the mild symmetric adrenal hyperplasia and the intracranial changes a pituitary dependent hyperadrenocorticism with steroid induced hepatitis is the most likely diagnosis. Recommendations were for laboratory workup for possible Cushing’s and ultrasound guided fine needle aspiration of the liver for further definition. Medical treatment may be considered versus or in combination with radiation therapy. Transverse post contrast study of the brain showing the choroid plexus tumor within the third ventricle and the pituitary macroadenoma. Both tumors reveal marked contrast enhancement which is typical for extraparenchymal lesions. Sagittal post contrast study of the brain showing the choroid plexus tumor within the third ventricle with ventriculomegaly as well as the pituitary macroadenoma.